Brilliant concepts are often described in risible ways: ‘push the envelope’, ‘wake up and smell the coffee’, ‘don’t sweat the small stuff’, ‘let’s make a plan going forward’ and ‘blue-sky-thinking’. I aim to do all of those things most of the time, but never, ever will you get me to use any of those phrases. Take ‘blue-sky-thinking’ for example: the notion of devising creative ideas that are unfettered by the mundane or the pedestrian. The concept is perfect, but the cliche-ridden packaging kills it stone dead. But then it struck me that perhaps ‘blue-sky-thinking’ would be better if I reverted to taking it literally rather than metaphorically. 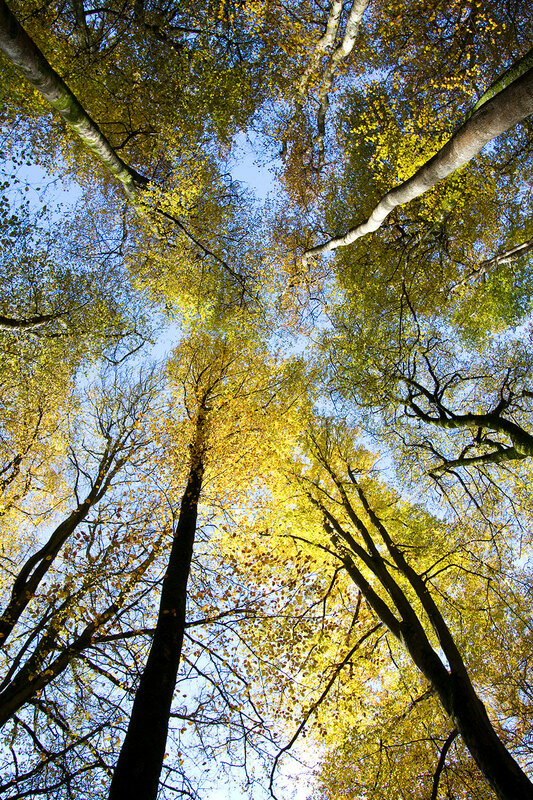 Lying on a forest floor and staring up through the canopy of trees at the blue, wintry sky beyond is as good a way of thinking new things as any and it certainly took some of the sting out of the cliche. To be absolutely truthful, the idea that came to me while I looked up through the canopy of leaves wasn’t exactly revolutionary. All I kept thinking as I stared up at the sky was that looking up is the same as looking down – it’s the simple action of taking a different viewpoint that counts. To prove my theory, I’ve been staring down into a pot of home-made orange curd to see what inspiration might come. My orange-pot-thinking produced two and a half decent ideas – I will tell you about them in my next post. In the meantime, here’s my recipe for orange curd to help you with a little orange-pot-thinking of your own. Add the butter, sugar, lemon juice, orange zest and orange juice to a pan and heat gently until the butter has melted. Pour the mixture into a heatproof bowl and place above a plan of simmering water. Strain the eggs into the mixture and stir constantly until everything is combined. It will then take at least an hour to thicken. Stir it frequently and do not allow it to get too hot – it will separate if you do. If you’re cautious with the heat, the thickening will take longer, but you will avoid calamity. Once the mixture is thick enough to coat the back of a wooden spoon, pour it into the sterilised jars and cover with a circle of greased paper. It will keep for around 6 to 8 weeks in the fridge. P.S. I have used the phrase ‘orange-pot-thinking’ three times in this post. It is now officially a cliche and I promise never to use it again – unless, of course, literally. That first picture is absolutely stunning Charlie, and I love this recipe, much more fun than the monotony of butter and toast! 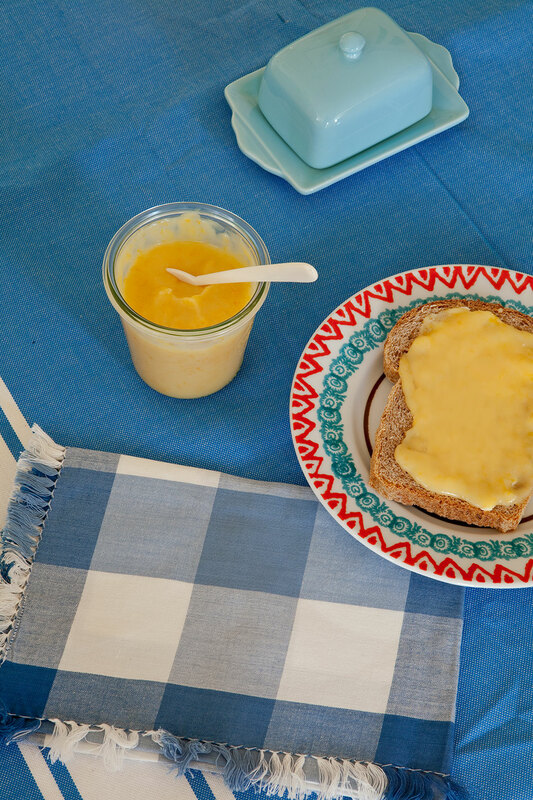 I suppose orange curd could become monotonous in the end, if you ate it every day – a bit like a cliche in fact. Thanks for commenting, Boinsey. It’s hugely appreciated. Gorgeous pic and you’ve really made me smile. I used to cringe on business training courses when these phrases were strung together. And the idea of gazing into a pot of orange curd for inspiration is wonderful. Thanks Andrea. It’s astonishing, isn’t it, that anyone could recommend these dreadful phrases. I’m very glad it made you smile. I rather like ‘blue sky thinking’, cliche though it be. I can’t recall who it was who defended cliches by saying if they were true or evocative in some way they were OK. ‘Going forward’ is, and always has been, execrable though. Why that should be so, if it is, could make an interesting study. I suspect colour cliches engage emotional responses and managerial ones don’t. Cracking pics and sparkling wit (or is that a cliche?) as always. You could be right. The subject of a PhD perhaps – emotion v management. Thanks so much for your comment, Jakey. And p.s. sparkling wit is absolutely fine by me! Your first photo is probably my favourite of all you have ever posted on this blog. It is stunning. I took the picture with the exceptionally talented photographer Guy Edwardes. His wildlife and landscape pictures are remarkable. OMG I agree. I have had a quick look at his website. That’s photography. I can deal with blue-sky thinking (although now prefer your alternative) perhaps because it’s because it evokes the picture of the intense blue of an English sky in my head immediately (the colour in your beautiful picture). Any post that has a pot of curd and the word risible is going to make a great start to my day. Sitting here with a smile on my face (as always) after reading. I was inspired to make the orange curd having seen pictures of your beautiful lemon curd in your New Year post. And I’m very happy to have made you smile, Sally. I hope Jasper enjoyed it, Karin. Thanks so much for your comment which really made me laugh. I have actually never heard the phrase “blue-sky thinking” – maybe it is specifically British? But I like the concept of it through your eyes – staring up through a veil of leaves into the blue sky. Dreaming. Or looking down and dreaming, thinking, rummaging through the dark corners of the brain for inspiration. And I love your orange curd. I have been wondering what to do with oranges and maybe that is it. Eureka! I’ve made lime curd and lemon curd but not yet orange curd. Onward and upward! To the stars! I wonder what the French or American equivalents might be, Jamie. I love the idea of lime curd by the way, which I’ve never tried but which sounds absolutely delicious. As you say, onward and upward. Blue-sky thinking is one of the few corporate speak terms that I actually don’t mind – it does call to mind images of lying in a field staring up at the clouds and doing some proper thinking – something we have all to little time to do these days. I love the orange-pot thinking analogy too as cooking is just another way of relaxing the mind so that it can focus on important stuff. My father was a huge fan of lemon curd but I’ve never had orange curd – a gross oversight I suspect! A consensus seems to be emerging that, as you say, blue sky thinking is nowhere near as bad as some of the other dreadful clichés and phrases that we hear every day. I wonder if that’s because it is at least imaginable as a concept – unlike the ridiculous ‘wake up and smell the coffee’ which I noticed David Cameron used in his recent Europe speech. (I think he needs a new speechwriter). I so agree with you about the relaxation of the mind that occurs when cooking. It’s when I have my best – to me at least – ideas. I will toast your father when I next eat lemon curd. My not-very-original thought was ooh, your bottom must have been freezing! Your orange curd looks delicious. I was very tempted when I saw bags of Seville oranges reduced to 25p last weekend and was racking my brain for something to do with them, (still suffering from marmalade exhaustion from the weekend before!). And then I thought of all that butter and sugar and the scones that I would no doubt make to use it all up … if only I still had the metabolism I had when I was 20! I wasn’t as cold as you might think, on account of the very unglamorous assortment of clothes I was wearing at the time. I know what you mean about ‘marmalade exhaustion’ – I have it too, as well as RSI in my spoon-stirring arm, although that’s come about because of too much typing! All those corporate phrases are funny. Like Sally I don’t mind blue sky thinking since it invokes imagery of blue skies that are rather lacking at present! ‘Going forward’ however is a phrase that always makes me cringe. Lovely recipe for the orange curd. Sunny and cheering on a non blue sky day. Are you serious? That’s so daft it’s funny. But infinitely preferable to ‘blue-sky thinking’. Reading this made me wonder whether I’d misjudged the lemon or orange curd all my life, but then I came to my senses, the World righted itself again and my view of the curd went back in its place.